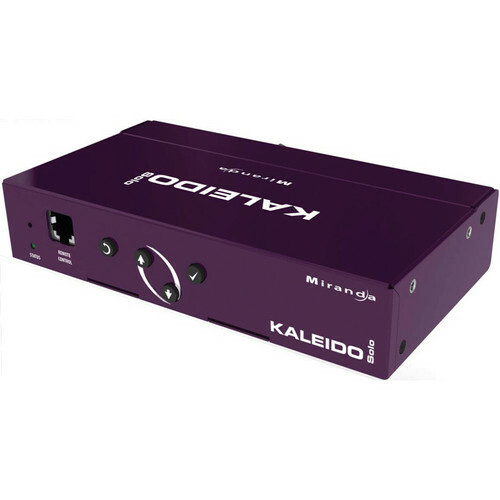 The Miranda Kaleido-Solo 3Gbps/HD/SD SDI to HDMI Converter with High Quality Video & Loudness Monitoring allows you to use low-cost LCD displays for video and loudness/dialnorm monitoring using histogram overlay. Compatible with speeds up to 3 Gbps, the converter is ideal for professional monitoring applications such as production, mobile truck, post-production, and broadcast. It also supports video resolutions such as 525i, 625i, 720p, 1080i, and 1080p and comes with a built-in scaler/de-interlacer. In addition to automatic input format detection, the KS-910 Converter also provides overlays for time code, AFD (Active Format Description), and peak meters. Display settings can be adjusted using the on-screen menu. Two audio connectors ease embedded audio monitoring by offering S/PDIF and analog stereo of a 5.1 downmix or any audio pair. Box Dimensions (LxWxH) 19.3 x 10.1 x 2.9"